Beatrix Potter’s third story was The Tale of Squirrel Nutkin, published in 1903. After finishing The Tale of Peter Rabbit and her second successful story, The Tailor of Gloucester, Beatrix began a productive two year period, from 1903-1905, in which she finished Squirrel Nutkin, as well as The Tale of Benjamin Bunny (inspired by her first childhood pet rabbit, Benjamin Bouncer), The Tale of Two Bad Mice, and The Tale of Mrs. Tiggy Winkle. At this point in her life, Beatrix still lived with her parents in London, and accompanied them on frequent trips to and from the Lake District, the setting for The Tale of Squirrel Nutkin. 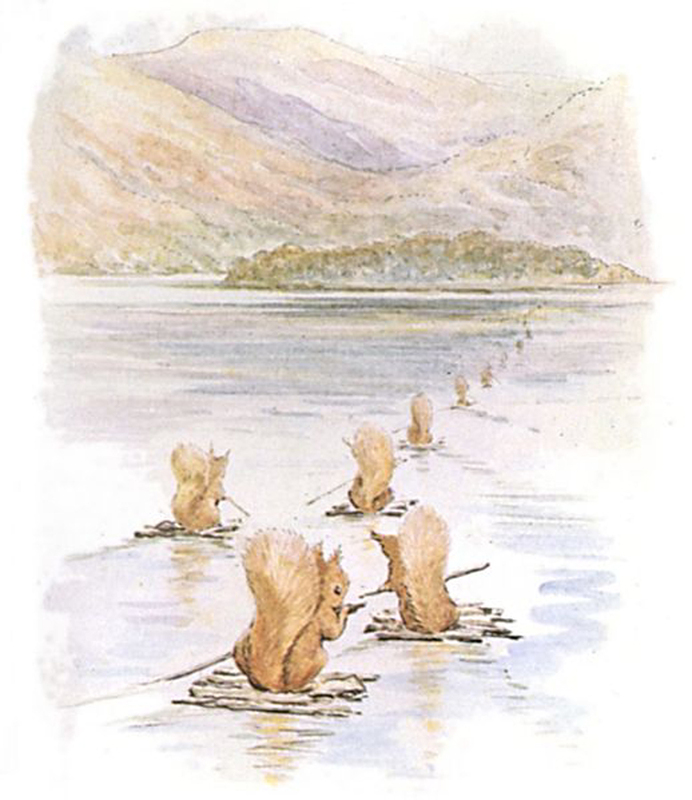 This scene from Squirrel Nutkin shows the squirrels rafting across a lake to an island in the center. The blue and green hues of the mountains, trees, and water are classic characteristics of the idyllic landscape in the Lake District.